Here are the latest videos & updates just for you! 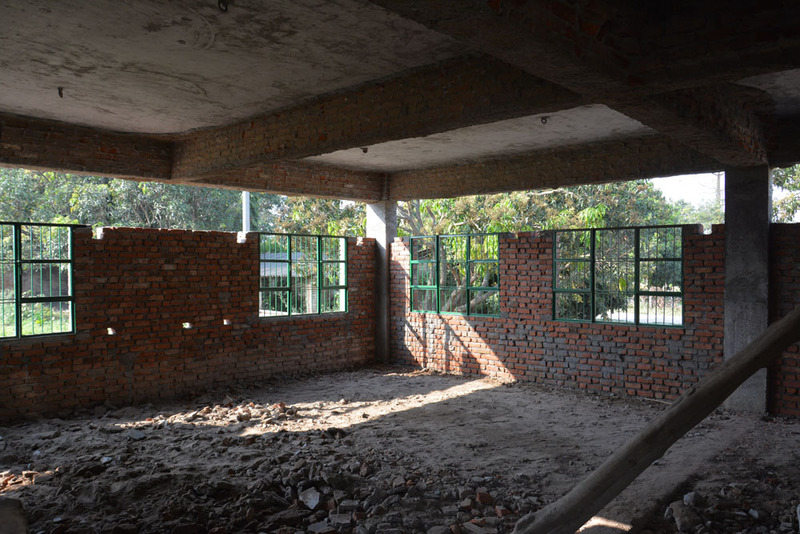 Campaign completed Funds raised $114,417….. Building will be achieved …. THANKYOU FOR ALL THE SUPPORT! Our Indiegogo campaign has been a huge success! We have now raised our final goal of$100,000! In actual fact we have raised more than that! Thanks to an incredible 10 year old girl, a Bollywood/Curry night in Melbourne, Australia and many other amazingly generous people who have given independently to our campaign we can now ‘check the final funding box’! The most touching story of all our supporters is about a young man named Sam Saxena. We would love for you to read his story here. You will surely be blown away by the goodness and generosity of the world. Outside the building, work has already begun on the First Floor. The internal verandah. Window frames are now installed and ready. 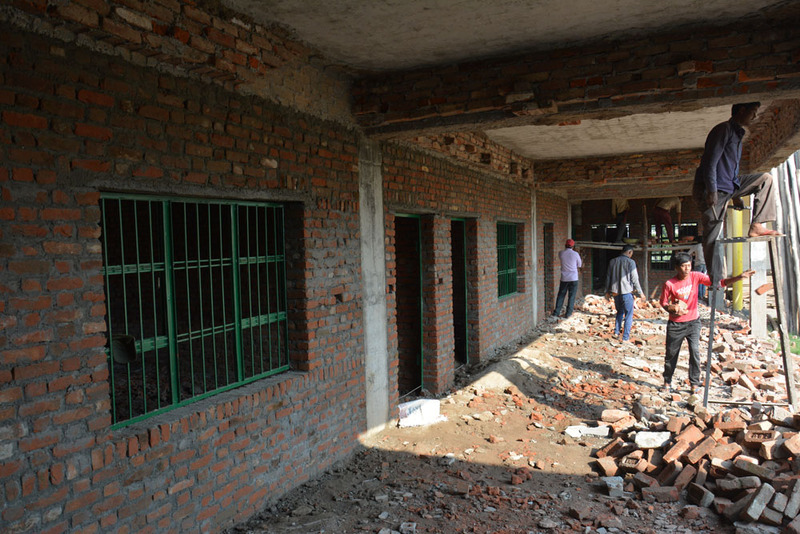 Inside a classroom: The walls/floor still need plaster/concrete. Thank you for believing in us, in our children and our dream. For your donations, your shares, your emails of support and your love we are forever grateful. 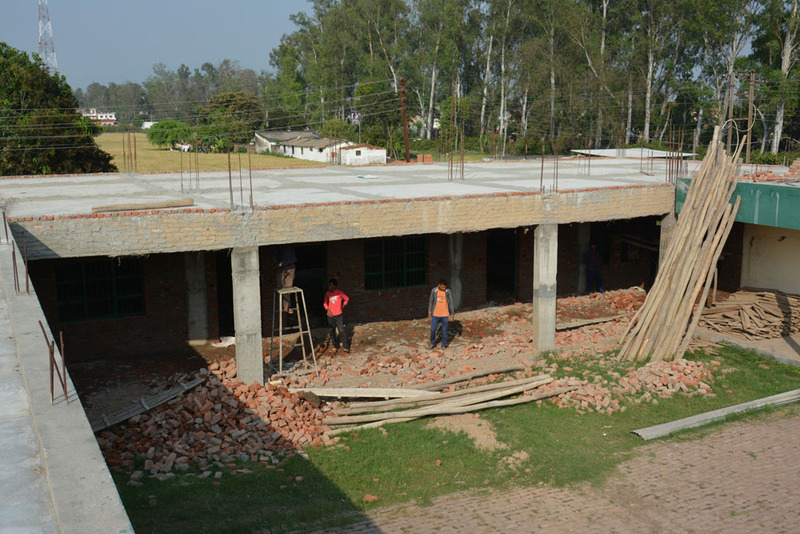 We will continue to update this page with progress of the building as well as our blog on www.indianorphanage.com. For those who would like to know more about The Good Shepherd Agricultural Mission you can sign up to our newsletter at the bottom of our website. Hey y’all. We’re coming around the home stretch. Only 12 days left. Clifton and I have been sitting on some big news…and will continue to do so until it’s official…but here’s a little updating that we can report. And there is more in the works. As you can see …. We’ve already secured the second phase of funding which is fantastic and who knows what is possible? On ward! FYI: The attached pictures show a school in Maine who raised $200 for our campaign. They used the jar in the middle labeled “Coins for Kids” to collect loose change. Literally, every penny counts! It’s been a while since our last update on our Primary School Extension project, but we’ve certainly been busy! Take a look at our progress so far! 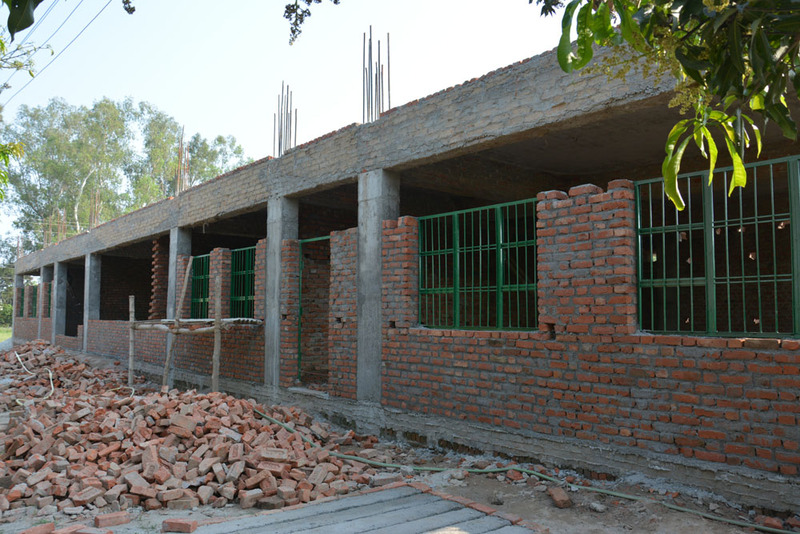 With two weeks still left on our Orphan School campaign, our ground floor windows and walls are already taking shape, with work on our school‘s first floor roof slated to begin soon. Our hope is that the ground floor would be completed and ready for usage by the end of July and at the same time the first floor columns and roof would be finished. This is a reasonably goal but it will take some hard work by our builders to achieve. The brickwork is almost complete across the ground floor but the real time consuming steps will be the rendering of the walls, pouring of the floors, electrical wiring and painting. 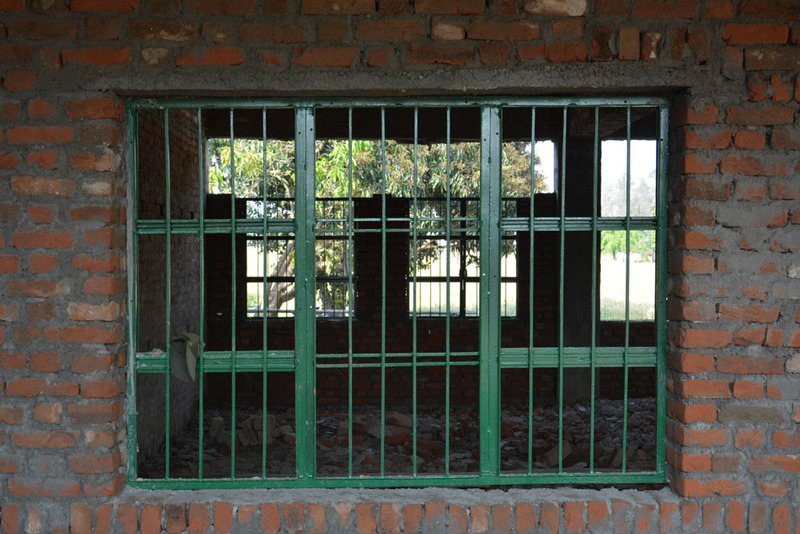 Our workshop boys whipped up the frames for the windows at a fraction of the cost we would have had to have paid if we outsourced them. There are two different sizes 6ft x 4ft and 4ft x 4ft. A final coat of paint and the glass will be fitted later. The room we are most excited about is the computer lab. At over 680sqft the room will be perfect not just for computer classes but adult vocational education as well as PD (professional development) classes for our staff. Our hope is the have a digital projector that can be used during the teaching process. The exterior of the building will be closed off in the next 2-3 days -now blocking off what was previously the road for parents/visitors to the school. The benefit to this is that guests coming to the school come through our front foyer which is far more secure. So many amazing people have come forward, fundraising, promoting and contributing to make this all possible. It has been incredible. And though there is still much work to do, we are beyond blessed by all that has been achieved so far. As if raising $2600 wasn’t awesome enough, Ruby was interviewed today by the legendary Kim Block from WGME in Portland, ME. Her story will air at 5:30 PM on Ch. 13 in southern Maine. Hope it inspires many more kids to get involved. Thanks, Kim!!! Today, a classroom of third grade students contributed $200 to Ruby’s campaign! So crazy and amazing! As part of their community service lessons, these kids collected loose change in a jar and decided to use it to help a fellow Maine student help some children in India. If that isn’t a story of hope for the world, I don’t know what is. Huge thanks to teacher Rich Pickering at the Margaret Chase Smith School in Sanford, Maine. You guys are awesome! I’m ten years old and I want to help an Indian orphanage get a bigger school. Hi my name is Ruby and I am 10 years old and I am excited to help out my friend John with raising money for a school in India. He is helping some really great kids in an orphanage there get a bigger school and I want to help them out. Maybe you do too. All the money I raise will go to help the Maxton Strong School in Banbasa India. Hi everyone! The campaign continues to slowly move forward. $38,900 means that we are now just $11,100 from completing Step 2. The slab work has been completed for the first floor and we have now begun construction on the windows and door frames for the ground floor. The colours of the Indian festival Holi hit our orphanage this week, we hope this photo of our kids in its aftermath brings a smile to your face! The last couple of weeks our builders have been busy getting the frame work put together that will eventually work as a mould to hold up the first floor and its supporting beams; the process is a little different here in our part of India -as the video shows. Finished! So awesome to have this done. Thanks to everyone who made it possible! 19 days in. Almost a third of our way through our 60-day campaign. Yes, we’re moving slowly…but in the past five days, we’ve raised $1000! So it’s still alive. And you never know. We’re like a business and we’re open every day, rain or shine. When the next big customer will walk through the door…we’ll be ready. I hope you’ve been following the work being done over at the school expansion, because it’s really something. Some people wait for six months or a year to see results from these types of campaigns. We just poured the roof yesterday! Amazing! Just know, we’re not finished yet. Tell a friend, back to basics. I have a class room here in America making a sister video to our campaign video. I wrote a script and the kids are taking turns saying lines, telling how they raised over $400 for the kids in India. They’re going to challenge the world to get involved. If they can do it with a loose change jar…one penny at a time…maybe anyone can. I’ll share it as soon as it’s finished. Keep the faith and thanks once again for all of your support. We really are making a difference. Just look at the roof we built!!!!! Please see the funds raised so far. Overall target is $100,000 for completion of the project. EXAM: GSAM ORPHAN SCHOOL Campaign STARTS NOW!